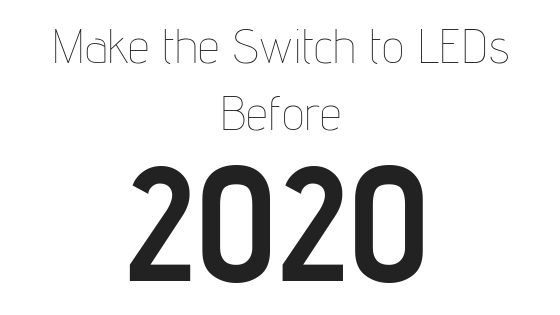 Switch to LEDs before 2020! LEDs have been steadily rising in the lighting market for many years, and for good reason! They are energy efficient, long lasting and becoming more and more comparable in cost to traditional lighting. The pros definitely outweigh the cons when it comes to LED lighting. Now, with a law passed in 2007 by the federal government, lighting must become 3 times more efficient by the year 2020. LEDs are already helping cover that ground. According to Energy Star, the average number of sockets in an American home is 50. Close to two-thirds of those sockets still house traditional, non-energy efficient lighting. If all Americans were to switch out their bulbs to LEDs, they would save upwards of 6 trillion dollars combined every year when it comes to lighting costs! Plus, LEDs last between 15-25 years, and cost, on average, only $1.08 a year to run. In comparison, a traditional incandescent light bulb costs $7.23 a year to power. On top of the energy savings, LEDs are a great choice due to their lack of UV ray emissions, meaning no discoloration of your clothing, furniture fabric, curtains or paint, and studies have shown they improve focus, attention, circadian rhythms, and so much more! In today’s fast-paced world, everyone wants to be a trendsetter. By installing LEDs in every socket in your home or business, you’ll be ahead of the game when it comes to energy efficiency. Don’t leave switching your bulbs to the last minute. 2018 is nearly gone, meaning you have a little over a year to make the switch to energy efficient lighting! Find All of Your LEDs at Sitler’s! Sitler’s has been paving the way for LED lighting in the market for years. We look forward to helping you make the switch to efficient lighting in the coming months and years, saving you time, maintenance, and money. Give us a call at (319) 653-2123 or reach out to us on our site here to get started!